Every home in the Permian Basin is dependent on a venting system or chimney that works properly. If the chimney or venting system doesn’t work as they are supposed to, the heating system therefor will not work as well. A dirty chimney has a huge potential to damage the chimney structure and its components by way of a creosote chimney fire. A chimney fire can also put you and your family at risk for loss of property and or loss of life. Regular professional chimney sweeps in Midland, TX, and inspections are the best place to begin if you are looking to achieve a safer, more efficient chimney system. WHAT CHIMNEY CLEANING SERVICES DO YOU OFFER? What is the process of cleaning a chimney in MIDLAND and how messy is it? We use various size wire and polyurethane brushes with fiberglass rods and quick connect to clean the chimney flue. We use similar brushes on rods to clean the smoke chamber, located just above and behind the damper system. While this process is in action, we place a special 3-speed vacuum, equipped with a HEPA filtration system and secondary backup filters, in front of the fireplace. This is to ensure all dust and debris stays confined to the firebox. Unlike most of our competitors, we also use our special vacuum and attachments to clean off the smoke shelf located behind the damper. 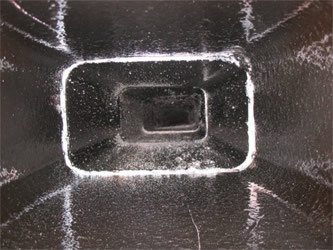 Most chimney owners do not know about the smoke shelf and therefore most sweeps will not clean this area, taking advantage of customers little knowledge of chimney systems and leaving their chimneys only partially cleaned. As always, we guarantee a “NO MESS” chimney cleaning service; that’s why our chimney sweep in Midland, TX is #1! HOW OFTEN SHOULD I GET CHIMNEY SWEEPS IN MIDLAND, TX? It is recommended that your chimney is cleaned and inspected according to the NFPA’s annual rule. Typically, if you burn more than a cord of wood per season, you will need to have your chimney cleaned out once a year. 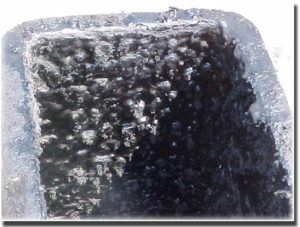 There are many factors that can affect how often your chimney should be cleaned. If you are using softer woods, such as pine or cedar, you will dirty your fireplace faster than you would when using hardwoods, such as hickory or oak. If you are burning “unseasoned” wood ( freshly cut timber that has not had sufficient time to completely dry out) your chimney can collect a glazing, we call this by-product “glazed-on” or 3rd stage creosote. If you still have any questions on Chimney Sweeps in Midland, TX or would like to schedule your annual inspection and/or cleaning give us a call at (432) 550-5575 or visit our CONTACT page to schedule your appointment online!